Clarins’ biggest launch in 2017 – and possibly the last couple of years – is the 8th generation of its Double Serum. The all-in-one anti-ageing serum (or as Marie-Hélène Lair the brand’s scientific communication director calls it, a “Swiss-army knife”); is made to improve the skin’s regeneration, hydration, nutrition, oxygenation, and protection. As its name suggests, the Double Serum has a unique dual-phase formulation: two-thirds hydric (water), and one-third lipidic (oil). The pump bottle contains two different vials for one important reason: when the hydric and lipidic solutions are kept separate until the point of application, the efficacy of the potent ingredients are preserved. The first-generation Double Serum Multi-Regenerant Concentre was bottled in 1985 in exactly the same way – the formula literally came in a set of two dropper bottles, with the contents to be mixed upon application. The latest Double Serum has been formulated based on the findings from the School of Medical Studies in Namur, Belgium, which has discovered the link between skin-ageing and cell receptors that regulate cell activity for skin vitality, says Marie-Hélène. Now, on to the ingredients: the star is a volatile molecule turmerone, extracted from turmeric which has been clinically proven to improve the cells’ ability to protect itself. For regeneration, organic green banana, avocado, myrothamnus, and red jania extracts are added. Teasel, beauty berry, goji berry, and horse chestnut extracts are blended in for oxygenation. Organic kiwi extract, and organic Mary’s thistle oil protects skin; while organic leaf of life, organic quinoa, organic marsh samphire, and cocoa extracts, moisturise. For protection; mango, huang qi, ginger lily, organic edelweiss extracts. To smoothen skin; orthosiphon extract, organic oat sugars. The 8th-generation Double Serum is very lightweight, as only plant oils are used. It is also easily absorbed as the 2:1 (hydric vs lipidic) ratio of the concoction is made to match the high concentration of water in cells, adds Marie-Hélène. The new pump also comes with a dial, that allows you to customise the amount. The smaller drop is good if you want a light application, while the larger drop is ideal for dry conditions, such as the plane cabin. Add one pump into your liquid foundation for a smoother application; or leave-on mask for an added boost. After one application, my skin felt more supple and firmer the entire day. More updates to come after I am done with the bottle. 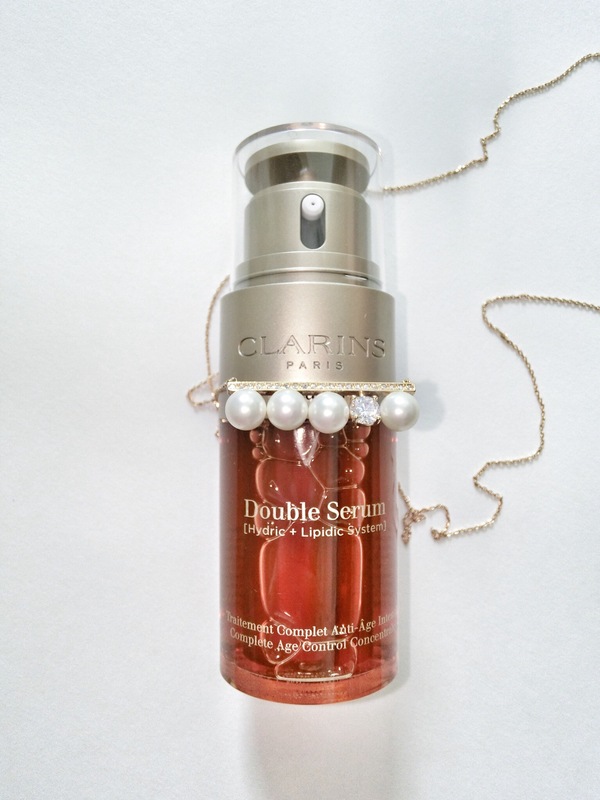 The 8th generation edition Clarins Double Serum comes in 30ml ($125) and 50ml ($170) bottles. Available at Clarins counters, Clarins Boutique at ION Orchard, Clarins Skin Spa and www.clarins.com from 31 August 2017.